Like most moms, I want to feed my family high-quality foods they’ll love. I check ingredient labels, pay attention to how things are made, and refuse to buy unwholesome, questionable foods. That’s why I was excited to learn that specially marked Tyson® chicken products are raised with no antibiotics ever. We’ve all read about the over-abundance of antibiotics in our nation’s food supply and the effect this may have on our kids in the long-run. So, learning that Tyson crispy chicken strips and Any’tizers® are 100% all-natural and made with minimally-processed white meat chicken raised without antibiotics? That’s something I can feel good about buying. The people who make Tyson chicken have had a strong heritage of raising chickens since 1935. To learn more check out this video! My son likes to have friends over for video game marathons or to watch football, so it seems like I always have a crowd of teenage boys in the house. Have you ever tried feeding a group of adolescent boys? They are non-stop eating machines! I used to dread game day due to their appetites. I mean, it’s nice knowing that my kid and his friends are hanging out somewhere safe and not getting into trouble, but sometimes it felt like I was a short-order cook! 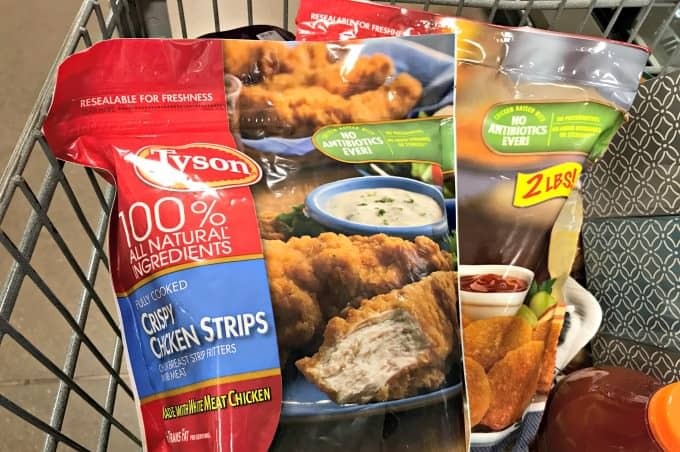 Last week while I was at Walmart, I picked up Tyson crispy chicken strips and chicken nuggets to keep the crowd happy while saving myself some time in the kitchen. 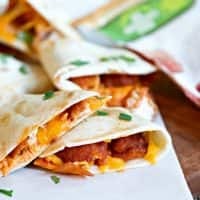 The crispy chicken strips with a side of barbeque sauce for dipping were a definite hit, and then I brought out my Buffalo Chicken Quesadillas made with Tyson buffalo-style Any’tizers® snacks. Teenage boys love snacks filled with nutrient-dense protein. Moms like me love snacks that don’t take long to whip up. 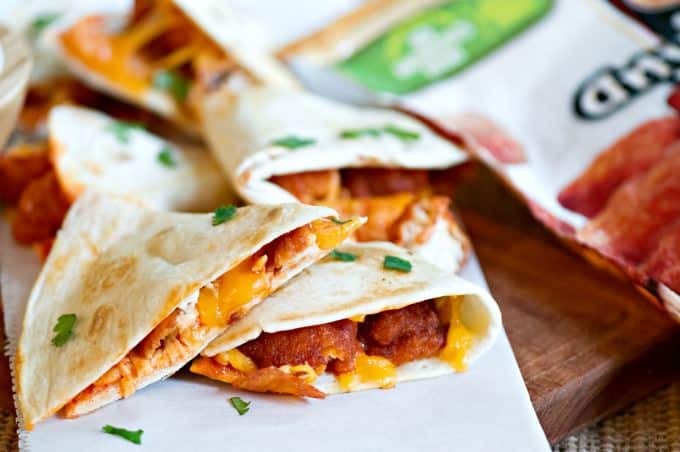 These Buffalo Chicken Quesadillas fit that to a T! The trick to making quesadillas that don’t fall apart when you turn them is to fold the tortillas over in half, rather than stacking them. That way, you can just grab your tongs and flip them by the open edge rather than trying to turn a floppy round quesadilla without the ingredients spilling out. Use the stovetop or a quesadilla maker if you’re fixing just one. But if you’re feeding a crowd like the one that spends most weekends hanging out in my TV room, I’ve provided an oven option, instead. Serve with a side of sour cream or even more buffalo sauce, and your crowd will also be your fans! Score big on game day or even just after school by serving these quesadillas filled with gooey cheddar cheese and Tyson® buffalo-style Any'Tizers snacks. While the chicken cooks, preheat a skillet on medium-high heat and spray the tortillas on one side with the cooking spray. Turn the sprayed side down on a cutting board. Sprinkle the cheese on one half of the tortilla. Slice the chicken when it's done and arrange it on top of the cheese then drizzle buffalo sauce on top of the chicken and cheese. Fold the tortilla over, place it on the skillet, and cook for 2 minutes or until golden brown. Flip and cook an additional 2 minutes. Transfer to a plate, slice, and serve. After folding tortillas over, arrange them on a baking sheet. Preheat the oven to 350°F and bake the quesadillas for 5 minutes, turning halfway through. Like this recipe? Pin it to your Snacks board!